Information received and published from sources in the North Indian town of Dharamsala, home of the exiled Tibetan Administration, have reported a number injuries to Tibetan monks as Chinese paramilitary opened fire upon them as they sought to prevent the charred body of a Tibetan self-immolator being confiscated. According to reports that quoted a localTibetan, ‘the police forcefully cremated the body of Kalsang Yeshi, 37, who died minutes after setting himself on fire on Tuesday, in an electric crematorium’. Other accounts claim that relatives of the Kalsang were at gunpoint forced to dump his remains into a nearby river! Two family members of the deceased were forced to throw the remains into a river at gunpoint, the source said. 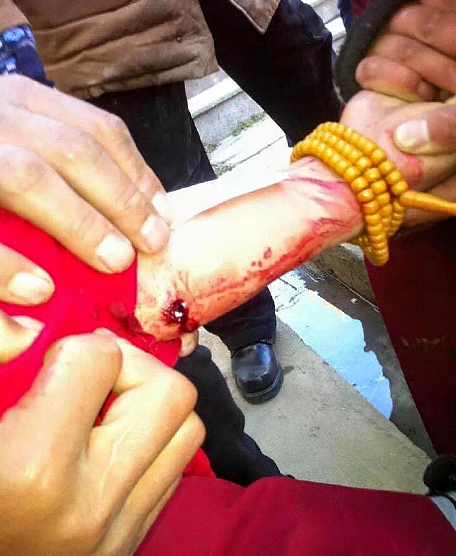 The same source also reported that other Tibetans injured in this latest assault are fearful of attending hospital lest they be arrested.